Ancestry.com. 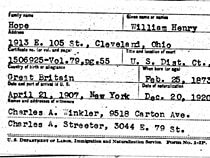 U.S. Naturalization Records Indexes, 1794-1995 [database on-line]. Provo, UT, USA: Ancestry.com Operations, Inc., 2007. Original data: National Archives and Records Administration (NARA) Microfilm Publications; Records of District Courts of the United States, Record Group 21; National Archives, Washington, D.C. Scroll down to the bottom of this page for NARA microfilm details. This is an index of nearly 2.5 million U.S. naturalization records for various courts (primarily U.S. District and Circuit courts). Bob Hope became a U.S. citizen through his father's 1920 naturalization. This database contains images of original U.S. naturalization records (primarily Declarations and Petitions) from U.S. District and Circuit courts. Naturalization records included in this database cover areas from the states of Alaska, Arizona, California, Delaware, Maryland, Pennsylvania, Virginia, Washington, and West Virginia.